Small Team. Big Brief. Real Perk: Advocating Before the Supreme Court. 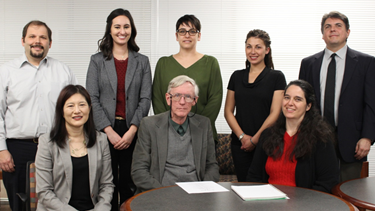 UNM School of Law Distinguished Professor Jim Ellis with some of the faculty and students who advocated for the disability community in an amicus brief before the U.S. Supreme Court. For more than 30 years, University of New Mexico School of Law Distinguished Professor Jim Ellis has been working with teams of law students to advocate for the disability community in amicus briefs in cases before the U.S. Supreme Court. Students learn every aspect of the advocacy process. They scrutinize every word of the case, work long hours, and receive a real-world education from a leading expert. Some have the opportunity to accompany Ellis and other faculty members to Washington, D.C. to hear the arguments in the U.S. Supreme Court. Most of the students say it is the best experience they have had in law school. The most recent student team, Class of 2017 students Laura Callanan and Ben Jacobs and Class of 2018 students Sarah (Nelle) Bauer, David Domingos, Keri Rezac, and Noell Sauer worked side-by-side with Ellis, reviewing the record in Moore v. Texas, the latest in a series of Supreme Court cases involving people with intellectual disabilities (ID; formerly known as mental retardation) and the death penalty. “The problem in Moore is that Texas uses “factors” to diagnose intellectual disability in the death penalty context which are not based in science, but in stereotypes about people with ID. It doesn’t use those fabricated factors to diagnose ID in any other context. It doesn’t use them to diagnose ID for housing, supports, or anything but execution eligibility,” says Ann M. Delpha, Ellis’s co-counsel and the staff attorney at the law school who coordinated the project with the students. In addition to the law students, Delpha, and Suzuki Ellis’s team included Professors Steven K. Homer, April Land, and David J. Stout, who all contributed to the drafting and editing of the Brief of Amici Curiae on behalf of the American Association on Intellectual and Developmental Disabilities (AAIDD) and the Arc of the United States (The Arc). The goal of the amicus brief was to explain the necessity of using of valid, well-researched, and clinically-proven science in the diagnosis of intellectual disability in any context, but particularly in the high-stakes death penalty situation. As a result, the brief has over forty citations to scientific literature in addition to its legal citations. The faculty found the students’ work to be invaluable. “They used their legal skills to analyze complex legal issues and contribute to the framing of the issues, and their diligence and attention to detail contributed immensely to the quality and accuracy of the work,” said Delpha. Even after the amicus was filed, the students have kept up with the case, meeting with Ellis, Delpha, Land, and Suzuki to review and discuss developments and the content of other filings as they happened, right up until the case was argued. They plan to meet again after the opinion is issued. Land, who teaches primarily in the Clinical Law programs, has been co-counsel with Ellis and has supervised the students on almost every amicus project since 2000. Ellis and a few of the team members on the steps of the U.S. Supreme Courthouse. 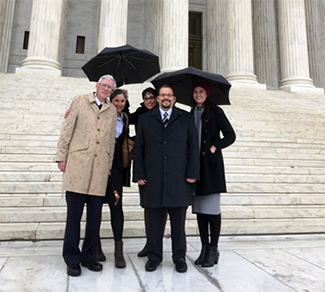 The culmination of their efforts began at 4:45 a.m. on November 29, in a misting rain, when Ben Jacobs, Nelle Bauer and Noell Sauer lined up on the Supreme Court’s Plaza at One First Street, NE, in Washington, DC, to make sure they could get a seat for the argument in Moore, scheduled for 10:00 a.m. that morning. The students were thrilled to feel the intimacy of the relatively small courtroom, and to realize that they were close enough to see the reactions of the individual justices as they considered the arguments made by each attorney. During the argument, the students were particularly pleased to see that the justices had indeed read and considered the amicus they helped to create, as one justice made reference to an argument in it. “It was thrilling to watch Supreme Court Justices, each in their own way, passionately engage with arguments that we had some role in presenting,” said Jacobs. Afterwards, the team had an informal meeting with Ellis on the plaza in front of the Court, and discussed their impressions of what they had seen and heard in arguments.